Welcome to Day #4 of Dark Chocolate Blends Theme Week. 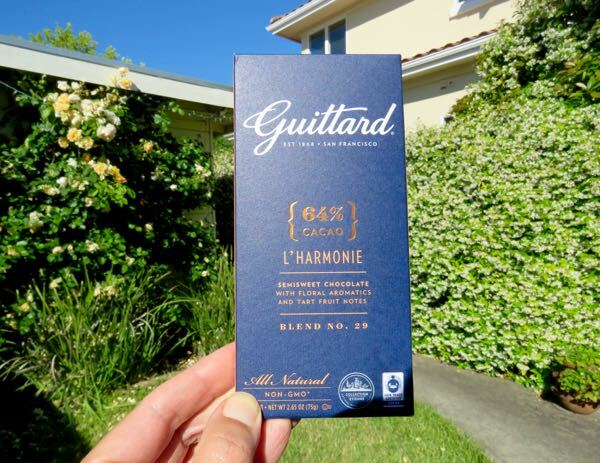 Today's L'Harmonie 64% Cacao bar (Blend No. 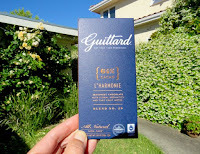 29) from Guittard (Burlingame, CA) was an upbeat* dark bar with subtle floral and fruit (apple, banana, apricot, light tropical) and with a faint hint of floral green tea. Tasting notes printed on the packaging read: "Semisweet chocolate with floral aromatics and tart fruit notes." The L'Harmonie bar incorporated cacao from Central America, South America and the Caribbean. The varieties of cacao that were selected from these three regions included the three primary members of the cacao holy trinity: Forastero, Trinitario and Criollo beans. *This dark chocolate bar was lighter, sweeter and more carefree (if dark chocolate can be carefree) than most of this week's ultra-dark bars. Stands to reason, as there was more sugar in this bar than other dark blends sampled so far this week.